On March 20, 2008, Gurbanguly Berdimuhamedov issued a Decree on the establishment of the Institute of International Relations of the Ministry of Foreign Affairs of Turkmenistan. The main aim of the Institute is to train highly-educated specialists for the diplomatic service of our country. On December 29, 2009, our Esteemed President signed the Decree on the construction of complex of new buildings of the Institute of International Relations of the Ministry of Foreign Affairs of Turkmenistan. The complex was built by the French construction company “Bouygues Batiman International”. On September 1, 2011, the opening ceremony of the new buildings took place with the participation of our highly Esteemed President Gurbanguly Berdimuhamedov. The Institute includes the main building, academic corps, dormitory and sport complex. The main building includes the Rector`s office and lecture-rooms for 250 students. Archives, a doctor's room and engineering staff's room are on the ground floor. The museum, “Revival” room, students' administration, offices of the Institute's social organizations and the library of the German language are located on the first floor. The assembly hall for 500 people is on the first floor too. This floor also includes a legal hall for 100 people and another conference hall for 200 people. Building for the students of International Journalism and International Economic Relations is located in the west part of the campus. There are an archives, tennis hall, dining-hall and canteen on the ground floor. The two fountains, beautiful walkways and pavements, neat green areas located in front of the main building and gives special attraction to the whole complex of buildings. In general, the new building complex of the Institute of International Relations of the Ministry of Foreign Affairs attaches a peculiar beauty to the architectural view of the urban development of the capital. All this is another evidence of constant attention and paternal care of the Esteemed President of the country in establishing the national Alma-Mater of Turkmen diplomacy and its development. A library equipped with the most state-of-the-art technology is under the service of lecturers and students of the Institute. 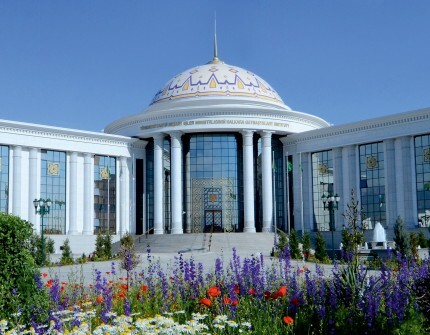 The library fund is constantly replenished with books of the Book Center “Vival” of the Ministry of Education of Turkmenistan, the number of which currently makes 12,000. The Ministry of Foreign Affairs of Turkmenistan and the Ministry of Justice of Turkmenistan presented books on all disciplines containing valuable information to master future profession. Representatives of the UN agencies, the OSCE Center in Turkmenistan presented educational literature on international relations, human rights, international journalism and other publications to the library. The library is also augmented by literature presented by ambassadors of various foreign countries during their visits to the Institute. Printed and electronic versions of lectures on all subjects written in accor-dance with the curricula are available in the library. There is an access to the electronic samples of textbooks and manuals published by the Ministry of Education of Turkmenistan. In-depth scientific works of our highly Esteemed President occupies special place in the library of the Institute. The latest publications of the country are under the service of the reader. The students have an access to the latest technology of the library. All materials in the library are converted to soft copies, electronic catalogues are formed and e-library is launched. In May 2010, with the support of the Embassy of the Federal Republic of Germany and the German company “RWE,” a library of the German language has been established for the students' for in-depth study of the German language. The library consists of two specialized reading rooms equipped with computers. Various textbooks, fiction, dictionaries, audio-video discs in the German language facilitate the intensive study of the German language. Main books “Schritte International,” “Lagune,” “Tangramm-Deutsch als Fremdsprache,” a collection of additional exercises, special notebooks for dictation, DVDs with movies are invaluable methodological support for conducting lessons at the appropriate level. Books and videos, special literature about the history, culture, customs, traditions and holidays of Germany occupy special place in the library. Students can improve their knowledge use hardware can find information they need at the library. A museum of the history of the Turkmen diplomacy is on the ground floor of the main building of the Institute. The bookshelves of the library include such diplomatic documents, as a thank you letter to the ruler of the Turkmen state Kunyaurgench Atsyz to the Caliph of Baghdad Muktefi Liemrillyu as a sign of deep respect, a congratulatory letter of Mustanjitu Billyani on the occasion of his accession to the throne of the Caliphate, a copy of a letter of instructions addressed to the Vizier of the Shirvani state. In the museum there are the Decrees of the President of Turkmenistan “On the Establishment of the Day of Diplomats,” “On the Creation of the Institute of International Relations of the Ministry of Foreign Affairs of Turkmenistan” as well as a copy of a congratulatory message addressed to diplomats, teachers and students of the Institute of International Relations of the Ministry of Foreign Affairs of Turkmenistan. The museum also keeps materials on the accession of Turkmenistan to the United Nations. Photographs telling about the era of Oguz Khan, the history of the city-states of Altyn-Depe, Ancient Margush, the Ancient Parthian state, the Seljuk Empire, the Ancient Turkmen State Kunyaurgench are on the walls of the museum. The museums has been enriched by materials that tell about specific moments of the high level meetings of the Esteemed President of Turkmenistan Gurbanguly Berdimu-hamedov with the heads of states and governments during official, state and working visits abroad. Numerous research papers and books of the Turkmen leader as well as materials that indicate the conferment of honorary titles to the Head of State, diplomas and other high awards are in the museum. The museum has books, speeches, reports on the foreign policy of the state by the Esteemed President, magazines “Foreign Policy and Diplomacy of Turkmenistan” and some other. The Institute conducts work on large-scale international cooperation. During the official visit of the President of Turkmenistan to the Republic of Croatia, the Memorandum of Cooperation between the Institute of International Relations of the Ministry of Foreign Affairs and the Diplomatic Academy of the Ministry of Foreign Affairs and European Integration of the Republic of Croatia was signed. During the official visit of the Esteemed President to the Turkish Republic from February 28 to March 2, 2012, a Memorandum of Understanding was signed between the Institute of International Relations of the Ministry of Foreign Affairs and the Diplomatic Academy of the Ministry of Foreign Affairs of the Republic of Turkey. On October 9-10, 2012, during the visit to the Swiss Confederation, a Memorandum of Understanding between the Institute of International Relations of the Ministry of Foreign Affairs of Turkmenistan and the Geneva Center for Political Security (Geneva) was also signed. In 2013, a Memorandum of Understanding was signed with the Diplomatic Academy of Ukraine. In November 2014, a Memorandum of Cooperation was signed with the Diplomatic Academy of the Ministry of Foreign Affairs named after K. Dikambayev of the Kyrgyz Republic. A Memorandum of Understanding with the Institute of Diplomacy of the Ministry of Foreign Affairs of the Islamic Republic of Afghanistan was signed in January of 2015. On July 10, 2015 was signed Memorandum of Understanding between the Institute of Diplomatic Service of India. On October 8, 2015 was signed Memorandum on cooperation between the University of Economy and Diplomacy of the Uzbekistan Republic. On December 10, 2015, a Memorandum on Cooperation was signed with the Institute of Diplomacy of the MFA of Palestinea, on March 16, 2016, a Memorandum of Understanding was signed with the Institute of Peace and Diplomatic Knowledge of the Islamic Republic of Pakistan, and a Memorandum of Understanding with the Center for Political Science of the Information Technologies Institute COMSATS, May 1, 2016 the programme of cooperation was signed with the Emir Saud Al Faisal Institute for the Study of Diplomacy of the Kingdom of Saudi Arabia, on February 20, 2017, the Cooperation Agreement was signed with the Moscow State Institute of International Relations of the Russian Federation. On March 10, 2017, a Memorandum on Cooperation was signed with the Romanian diplomatic institute. On March 15, 2017, a Memorandum of Understanding was signed with the Institute of Diplomacy of the MFA of the State of Qatar, on August 24, 2017, a Memorandum on Cooperation was signed with the Diplomatic School of the Ministry of Foreign Affairs of the Republic of Armenia, on March 13, 2018, a Memorandum of Understanding on cooperation in mutually beneficial areas of cooperation between the Institute for International Relations of the Ministry of Foreign Affairs of Turkmenistan and the Saud Al-Nesser Al-Sabah Diplomatic Institute of the Ministry of Foreign Affairs of the State of Kuwait. The inclusion of teachers and students of our institute into the composition of official foreign delegations headed by the President of Turkmenistan has become a tradition. Thus, teachers and students of the Institute, being a member of the official delegation of the President of Turkmenistan, attended the opening ceremony of the exhibition “EXPO – 2010” in Shanghai of China, during state visits to China (2012, 2014), Turkey (2012), Armenia (2012), Moldova (2013), Kazakhstan (2013), Japan (2013). The students of the Institute attend lectures by representatives of various UN agencies, the OSCE, the International Committee of the Red Cross, the University of Bremen in Germany, the Metropolitan University of London, the Institute of International Relations in Poland, the American University in Bulgaria, the Diplomatic Academy of Vienna, Boston, Ohio University, Columbia University's Harriman Institute of the USA, the Moscow State Institute of International Relations. In November 2014, the head of the Republic of Turkey, Rejep Tayyip Erdogan, who, by the decision of the Supreme Certifying Commission of Turkmenistan, was awarded the title of Honorary Professor of the Institute of International Relations of the Ministry of Foreign Affairs of Turkmenistan. When we talk about Turkmen-Turkish cooperation it is important to mention about the library on international relations in Turkish and English languages, which was opened on the eve of “Knowledge and Students' Day” on the first of September, 2015. This library will contribute to the students of our Institute in getting more education according their speciality. The lecturers of the Institute, within the framework of international educational programs, had training courses in countries such as Russia, Belarus, Ukraine, Uzbekistan, Kyrgyzstan, Kazakhstan, Azerbaijan, Tajikistan, Turkey, Pakistan, Bulgaria, Poland, Denmark, South Korea, Japan, China, Malaysia, India, the Kingdom of Saudi Arabia, the United States of America, Great Britain, Austria, France, Belgium and the Netherlands. On September 1, 2017, the Training and Methodology Center for Sustainable Development Goals was opened at the Institute. Training in the implementation of the SDGs, drafting educational programs and their implementation in secondary and higher educational institutions, development of methodological guidlines for the SDGs are among the tasks of the Center. The activities of the Center are built in partnership with the Academy of Civil Service, the National Institute of Education, higher educational institutions, public organizations, UN bodies, as well as with other relevant international institutions. In the Institute all necessary conditions have been created for students' study and leisure as well as for arranging various activities after classes. In their spare time students are involved in literary activities, scientific-research works and organize creative meetings with outstanding journalists, writers. A student music and dance ensemble functions at the Institute. It performs at different festivities held in the country. A national group of dutarists consisting of male students actively performs national music and songs at cultural events held at the Institute.The students of the Institute take an active part in an annual competition called Talyp Joshguny, which is conducted among higher educational institutions of the country. In addition, amateur clubs of different specialties operate at the Institute. Students take part in the clubs and are engaged in scientific-creative work on their interested topics related to their specialties. Within the framework of these clubs, along with scientific-research work, students organize different educa-tional activities. They are arranged by holding competitions among them in different fields of scien-ce. Moreover, the students of the Institute participate in scientific conferences, competitions held in other higher educational institutions of the country. All conditions for living and rest have been created in the students' dor-mitory for 248 students. It is well-equipped with all modern conveniences, including air-conditioning, heating system, laundry and kitchens. In the room “Revival” there are books by the Esteemed President and periodicals acquainting readers with the most important events in the country and abroad, where you can review them independently. The Institute of International Relations has created all conditions to promote health and improve sport skills of students. A modern sport building located near the academic building allows students to engage in sports, participate in competitions in various sports. The sport complex includes a sport hall designed for 300 spectators, a gym for 30 persons, as well as facilities for table games.